The long-awaited news finally arrived from U.S. Soccer high command yesterday. 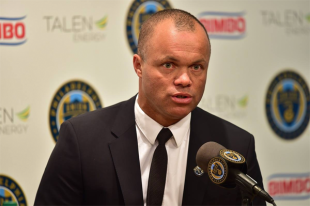 Earnie Stewart had been appointed as the men’s national team’s first-ever general manager. With Stewart’s time as Philadelphia Union’s sporting director coming to a close, it seems fitting to look backwards — and forwards. Dan Walsh already gave us the retrospective yesterday, examining Stewart’s Union tenure now that we see it reaching completion. This piece, then, is the prospective. U.S. Soccer has entrusted Stewart with management of the men’s national team, with the mandate of returning the team to the World Cup. Given what we’ve learned from Stewart’s time in Philadelphia, we can start to ponder how he’ll attempt to fulfill that mandate. If there’s a single takeaway from Earnie Stewart’s time in Philadelphia, it’s his belief in and commitment to making a plan and following it through. From the first day Stewart took the role, the Union’s plan has been clear. Create an organizational philosophy of football, and commit to it at every level of the club. Invest in the “developmental pipeline” — the Academy, the Steel, the facilities — and produce quality homegrown talent. And, when the time is right, augment that talent with purchases and acquisitions to build a competitive team. Though the jury is out on whether this plan will produce an MLS Cup for Philadelphia, it’s tough to argue that the club’s health isn’t much better now than when Stewart began implementing his approach. One thing is for sure — the Union have committed to the plan, to an almost frustrating degree at times. We’ll get to some of the downsides of that approach a little bit later in this piece. But for a federation too often lacking a top-to-bottom plan and an organizational commitment to following through, Stewart’s approach will be a breath of fresh air. Of course, implementing a plan like that requires organizational buy-in. It’s not enough to come in and dictate how you want something done — you have to develop relationships and convince people to work with you. That, too, seems to be another strength of Stewart’s. Stewart inherited some staff from the previous regime in Jim Curtin and Chris Albright. But, rather than pushing them out the door to make way for his people, Stewart developed a seemingly productive working relationship with both men. That strong relationship extends to Steel head coach Brendan Burke and those involved in leading the Union academy. Stewart’s time in Philadelphia shows the capability to get an organization on the right track — something U.S. Soccer sorely needs. An interesting question surrounding the general manager position is whether the youth teams will come under his orbit. The U.S., after all, has missed two consecutive Olympics — failures that have resulted in a talent pool short of major-tournament experience. Whether Stewart will have full control over the youth teams, including choosing the various coaches, remains to be seen. But it seems likely that Stewart will insist on working young talent into the senior national team early in the World Cup cycle. We’ve seen the Union’s commitment to that pathway through the development of players like Auston Trusty, Mark McKenzie, Anthony Fontana, and Derrick Jones this season and last. Expect that to continue with the national team, with talented yet unproven players like Weston McKennie, Timothy Weah, and Cameron Carter-Vickers given the chance to stake their place in the national side. Finally, Stewart’s Union tenure should benefit the national team in one more major way. Though Stewart is a former national team stalwart, his career as an executive began in Europe. Before 2015, little could be known about Stewart’s current knowledge of the domestic game. After two and a half years leading an MLS franchise, that doubt should be gone. He is now intimately familiar with the intricacies of MLS and USL, has contacts across the country, and enjoys the full support of the Federation. Even if he doesn’t have a glittering resume of success with the Union, he should have sufficient experience to navigate the political world of U.S. soccer. Though Stewart has the tools to succeed in his new position, some aspects of his Union tenure do give cause for concern. While Stewart may be heralded as a strong communicator within the club itself, his messaging with fans and media has been questionable. Stewart imposed a previously-lacking message discipline across the Union, nearly eliminating all leaks about any Union player movement. One wonders whether this buttoned-up approach has contributed to a club culture that is too skeptical of any criticism from the outside. At town hall meetings, Stewart often came across as defensive or unsympathetic to fans. In one memorable statement documented by Kevin Kinkead, Stewart criticized fans for booing Jim Curtin, observing that “Monday through Friday, I don’t see anyone out there [watching practice].” Never mind the fact that first-team practice is always closed to the public — Stewart’s comments had a tendency to be tone-deaf in the face of a fan base hungry for anything resembling competitive soccer. That won’t do with U.S. soccer. The fans are up in arms over the squad’s failure to qualify for the World Cup, their fury forcing changes in the federation that led directly to Stewart’s appointment. What Stewart won’t be able to do is to talk down to them, or to dismiss their desire for competitive soccer as irrelevant. Part of his job is to detoxify the conversation around U.S. soccer, and his approach with the Union won’t solve that problem if he brings it to the national team. On a similar theme, Stewart’s Union tenure has been marked by inflexibility. The Union have committed to a rigid tactical system for the last three seasons, even when certain necessary pieces were lacking. Last season’s campaign may have been sabotaged from the beginning by Stewart’s failure to replace Tranquillo Barnetta with a similarly competent No. 10. And whether the blame for sticking with the 4-2-3-1 even without that player should be assigned to Stewart or Curtin, it indicates a worrying lack of short-term pragmatism. At the national team level, that could prove costly. Unlike at club level, a national team’s talent pool is largely set, with minimal ability to bring in new players. If the top talent in the player pool is a poor match for Stewart’s and the new manager’s preferred style, will flexibility win the day? Or will the United States, like the Union before it, get stuck trying to fit Roland Alberg-shaped pegs into Tranquillo Barnetta-shaped holes? The most important question with Stewart’s new role, however, is one where we can’t draw a good parallel to his time with the Union. With the Union, Stewart had near-total control over the club’s soccer operations. Stewart reported to no one except Jay Sugarman, who afforded total deference to Stewart’s judgement on soccer-related matters. Stewart had seemingly unilateral authority to, for example, remove the Union’s manager — though he never chose to exercise that authority. In other words, Stewart’s powers were clear, and his role was well-defined. That may not be the case with U.S. soccer. The federation’s internal political tensions are well-documented. With hindsight, Sunil Gulati’s unilateral power over hiring and firing the national team manager seems ill-advised, and the idea of appointing someone with soccer executive experience as a “general manager” makes sense. However, it’s not clear at the moment how much power Stewart will actually have. Will he have full authority to hire and fire the manager? It’s unclear, as any recommendation Stewart makes will need to be approved by the federation’s board of directors. That could be simply a rubber-stamp, or it could represent significant executive interference that Stewart never experienced with the Union. It’s also unclear how much authority the general manager will have to oversee the youth sides. If Stewart doesn’t have much say in the pipeline of talent to the first team, how effective will he really be in building the senior national team program? These questions will likely only be answered by time and experience. Maybe Stewart will make it work, and these concerns will seem silly four years down the road. But — for now — there’s some danger in Stewart’s taking on such a poorly defined role. Breaking news: US Soccer announces commitment to the 4-2-3-1, brings in CJ Sapong as lead man, teaching other forwards how defense, hustle and the ability to take fouls can trump shots and goals. It is a huge gamble. He was hired since he talks nicely about systems and processes but has had not produced any WINNING record yet in the US. The Union’s record was 11-14-9 in 2016 & 2017 and is currently 5-6-3. He has not shown that he is able to hire great coaches and it is most unlikely that his Union plan “will produce an MLS Cup for Philadelphia”. His plan may result in us finally winning a playoff game at some point…. If US Soccer is serious in winning a WC in the next 10 years then they should have hired a better candidate. winning a world cup in the next 10 years? ….We should not be trying to win a world cup! Just like we should to be trying to produce a Messi! They are totally unrealistic goals. Lets produce World Class players before greats of all time (player or one of 8 counties to actually hold the trophy). Let’s produce teams able to win a bracket and not face the harder first knockout round game so they can actually advance in the knockout stages. These are the real goals. At least they are mine. The United States of America is a jump to light speed away from ever winning this event. Best best best best case scenario is two decades IMO and that is assuming ‘these policy issues’ we have in the country aren’t an albatross(es). If you don’t dream about winning the cup and have it as your vision, why play? Come on, El P, don’t be a grump. Cheer the man on like you did in 2002. Ditto what the elephant says here. In 20 world cup over a span of nearly 90 years only 8(!) different countries have won the World Cup. England, which invented the sport, has won it once. Countries with rich footballing histories of 100 years have yet to win it, including our continental near neighbors of Mexico, who I would think have the better shot of winning it all sooner than the U.S. There are certainly reasons to be optimistic — we have a current generation of young players plying their trade in Europe, so we might see a U.S. team favored for a quarter final in the right circumstances, but that’s going to take a long time. Based on the last fundraiser I attended (before the men lost to T&T), I would agree with Guido that U.S. Soccer’s publicly stated goal is to win the WC. They want to host the finals, and then win the whole thing. The examples they provide are England and France. (Uruguay not so much, because that was truly a long time ago.) These are not secrets. These are the goals of the federation. They may not be realistic goals, but they are the goals: host the WC finals, win the WC. Earnie’s biggest weakness with us, ironically, was playing Moneyball — wisely spending our dollars within the MLS salary cap. It left us with white whales like Jay Simpson, and no resources to get a #10 when we desperately needed one last season. That is, of course, a non-issue with the national team. It really isn’t clear what the responsibilities will be in this new role. However, for everyone who doesn’t know why we need one, I recommend the long article recently published about the Klinsmann Era and how he failed us. It is clear that someone else who knows soccer is needed as a check on the coach to prevent that from ever happening again. You mean the article that completely scapegoats Jurgen Klinsman? That article? Look Jurgen was an issue — of this I’m sure…. but the issues are much deeper than one man’s control as coach and technical director of NT. They are hardly mutually exclusive, Señor Longsnout. In fact, one might argue that the person is able to do more damage because of the policies in place. That means that the policies need to change — absolutely. But it doesn’t expunge the record of the person. But in any case, hiring a GM for the USMNT is the major policy change that I was referring to. It should hopefully prevent a manager from straying so far off base for so long a time before being reeled in. At least one hopes. One point overlooked. Tannenwald pointed out last year that Klinsmann’s base salary was equal or greater than the entire world cup winning us WOMEN’s team’s combined base pay. That didn’t even include his travel expense paid by ussf supposedly for renting a helicopter to go to and from practice. More an indictment of Sunil than Klinsmann but shows need for some oversight role that hopefully GM helps fulfill. How well will Ernie do is anybody’s guess as this is a new position and nobody knows how it will translate to the program yet. At least he understands where the program is and how the process differs from other countries. My prediction is half the U.S. soccer community will hate his first coaching hire. Only half? You’re an optimist. I only met the man once, at the Union academy open house. Coincidentally that was a watch party for the usmnt game…I remember his facial expressions as he watched with his son. It was similar to Pulisic’s when team eliminated a year later. Whether or not he does a good job, his commitment and passion are there. I only know of Sunil, Arena, and Klinnsmann from media so I can’t say for sure, but I’m convinced Mr. Stewart felt that loss and subsequent disqualification more deeply than the other 3 combined. I look forward to him to righting the ship and proving El P very wrong. Everything for me is hoisting that trophy. Its the only thing that matters from my seat, because it becomes the clearest indicator of the domestic games growth culturally and individually. The players on World Cup winning teams are ALL world class. We have 1……and in fairness to the young man, he’s not even world class yet. Did you see the list of 20 French players that haven’t even made the roster for the national team of France? Leroy Sane, arguably one of the best wingers in the world didn’t make his country’s roster. Mauro Icardi, arguably one of the most lethal strikers in the world didn’t even make his country’s roster. World Class players left OFF rosters. My original response was to the poster, Guido writing we are close. We aren’t. Prove me wrong, Earnie. Develop world class talent and I will be proven wrong if all the pieces are then made to fit….. Until then quite simply, NOT GOOD ENOUGH- not even close. If I buy into anything the Union has done with youth, I believe Earnie will do good things for USSoccer. Build from the bottom. If I buy into the idea that he brought in the change that resulted in Jones, Fontana, and others seeing the pitch, I believe Earnie can facilitate even more for the country. I hope he’s given twice the amount of time he had with Philadelphia. I hope in a generation we can look back at missing the World Cup and see hiring Earnie Stewart as the best decision.